The seniors jump into the pool as their parents and teammates watch. "Choosing to join the swim team my tenth grade year was the best decision I could have ever made. Being a part of this team has instilled character and work ethic that I will take with me through life," Brunette said. As the end of the year quickly approaches, the seniors celebrate more and more of their lasts: The last first day of high school, the last time they’ll dance at homecoming, the last time they’ll be with their friends at a football game, and many more to come. For the five seniors on the swim team: Christina Brunette, Sianna Hatch, Iris Kauffman, Dylan Kratzer and Jaelynn Namenwirth, Saturday, Feb. 2 was the last time that they would compete in a home meet. The meet started at noon and until the break, which happens between the 50 Freestyle and 100 Butterfly, operated like any other meet. During the break, the seniors and their families walked down the side of the pool and were recognized as student-athletes who would soon be leaving the school. The pool area had been decorated by the underclassmen with maroon and white streamers and balloons. There were posters of the seniors that displayed photos of them throughout the years. As the students and their families rounded the pool deck, the underclassmen from the team handed them red gift bags that the team gives out every year. As they continued to walk down the other end of the pool, they each stopped midway down the pool. Once everyone was at the midpoint, the seniors jumped in with their warm-ups on, a tradition for the team. Senior Christina Brunette has been swimming for Altoona for three years. She enjoys swimming the 100 Freestyle because it is a fast-paced event and is the perfect number of laps. This year she was a team captain. She plans to attend Robert Morris University and major in graphic design. She will also become a member of the rowing team. She is a member of the National Art Honor Society, Friends of Rachel, Chorus, Track and Field and is the manager of the softball team. “For me, leaving the team after this season does not just feel like leaving a ‘team.’ I feel like I am leaving a family and I am going to miss swimming and my teammates more than anyone will ever know,” Brunette said. Senior Sianna Hatch has been swimming for Altoona for two years but wishes she had joined sooner. She enjoyed swimming the 100 free because she was able to see the most improvement in herself. This year she was a team captain. She plans to work for a year before attending college and returning to help with the swim team. She is also a member of the National Art Honor Society. “I’ll miss being hyped up for the meets,” Hatch said. Senior Iris Kauffman has been swimming for Altoona for four years. She enjoys swimming the 500 Freestyle because she likes swimming distance. This year she was a team captain. She plans to graduate and live somewhere else. She enjoys cello, piano, ukulele and art. “I’ll think I will miss the team aspect of swimming the most. Having coaches who love and support you is like having a second family,” Kauffman said. 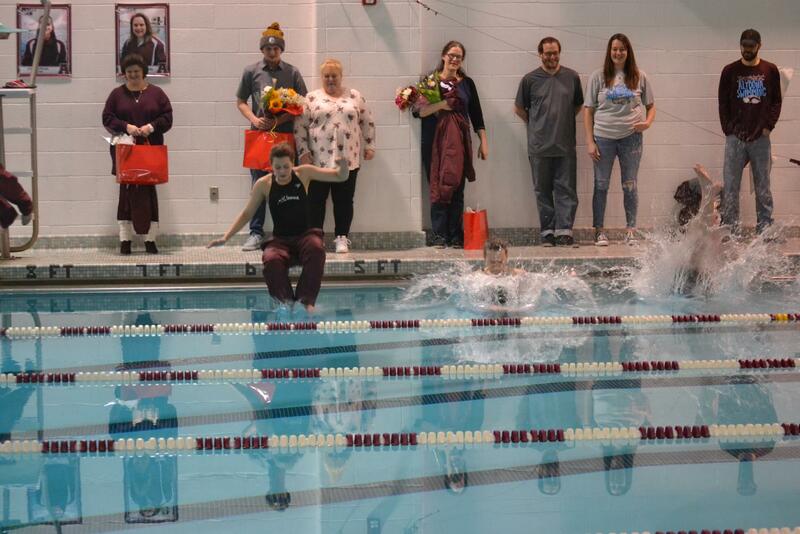 Senior Dylan Kratzer has been swimming for Altoona for four years and loved every second of it. He enjoys swimming the 500 Freestyle because it is more peaceful than the other events. This year he was a captain for the swim team. He plans to attend Penn Tech for electrical trades. He enjoys chemistry and physics. “I’m sad that I have to leave because it means leaving my friends and a sport that I love,” Kratzer said. Senior Jaelynn Namenwirth has been swimming for Altoona for one year. She enjoys swimming the 50 Freestyle because it is over quickly. She plans to attend college and major in the medical field. She is also a member of Sparkle Cheerleading, Key club, Big Brothers/ Big Sisters club, Band, and Circle of Friends. She plans to do something in the medical field. “I’ll miss my friends and the coaches,” Namenwirth said. Head coach Nanette Cummings was happy with the performances on Monday. “They’re a good group of kids. They’re going to be hard to lose. They’re a strong part of this team,” Cummings said. The swim team will be back in action for an invitational on Saturday, Feb. 9 at Indiana University of Pennsylvania.